It's Monday and time for the Monday HOPS! 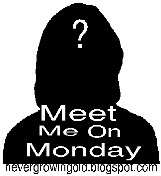 I'm linking with Java's Meet Me On Monday and Mellow Yellow Monday. Please HOP over to their blogs and join in the fun! Just click on the buttons--scroll down for Mellow Yellow Monday! 1. How do you order your steak? I rarely (no pun intended) eat steak but, when I do, it MUST be WELL DONE. 2. Are you superstitious about anything? Yes. I have to knock (gently) on my head three times every time I say, "Knock on wood." or else I'll jinx the whole thing and it will turn out bad. I also believe that a person can jinx a football game (well, any sporting event really) just by saying the wrong thing or doing something differently. And someone is jinxing the CRAP out of the Panthers this year. Just sayin'. 3. Who is your best friend (not including your spouse)? Not including Hubs or my daughters, my BFF is Leslie. We have been BFF's for about 20 years. Her daughter and our Deanie are the same age. She is just the best! She will always be honest with me and is not afraid to tell me when I am heading down the wrong path. She is always there for me and I can tell her anything. I'm pretty sure that I'd never make it through some of this life stuff without her! 4. When is the last time your wore a dress (for the guys...a suit)? Two years ago to Breezy and BestSonInLawEVER's wedding. I HATE dresses. 5. Do you have any trips scheduled? Just to the grocery store. There are places I'd love to visit but I just do not like to travel. And now, Mellow Yellow Monday! Just click the button below and join the HOP! I know what you mean about the jinxing of a sports team! It doesn't take much to jinx them. Loved your answersI I would love to have your Thomas Kincaid pieces, we have several pieces of his artwork. I will have to look into the Christmas Village. Hi There! Old follower dropping by to say hi! I love your answers! Here I was sad to say I had no trips planned....but you're right....I'm planning a trip to Costco, the grocery store and the post office - all in one morning :) Drop by and say hi! Hope you're having a great day. Enjoy the blog hopping. We have houses too. They get lit up for Christmas and the grandkids love to look inside. I enjoyed reading your answers, as always. The Christmas photo in the preceeding post is too cute! Don't you love modern technology? Thanks for stopping by! It's funny, I'm not a fan of travel either and it amazes me just how often I find myself on the road. Have a great week! Ooh I love the Thomas Kincaid house. It is superb. I tap my head too if I say 'touch wood'. I had to say your wonderful comment on my post today has still got me smiling. I shall definitely put South Carolina in my GPS and book a trip in the near future to visit my 'twin'...are the hubbies related too? Mine eats steak that still 'moos'. I don't have steak often but I think well done has no flavor. (sorry) Have fun at the grocery store :) I think if I was in better shape I would like to wear dresses. Great answers. Have a great week. I love the Kincaid Christmas Village, you are lucky!! Aren't best friends the best. Love the house from your Thomas Kincaid collection. I love his paintings. You don´t like to travel?! I love to, and can´t because it´s too expensive. Thanks for coming by!! I just broke your 200 mark! WOOHOO!! I'm quite the homebody, myself. HUBBY, however... loves to travel. We compromise and go on a cruise every year. That way he can see a few different places and when I just need to escape any chaos, my cabin is never far away. ;D I handled it better than I thought I would.